San Francisco and Santa Barbara: Printed by Graham Mackintosh, 1968. 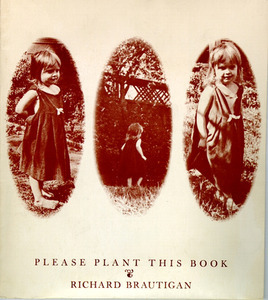 RICHARD BRAUTIGAN, ENJOYING great success as the foremost hippie writer of the sixties, though still published in small independent presses, here attempts to put into practice his Thoreau-inspired ideals, by producing a book that notes on the back cover, "THIS BOOK IS FREE." Inside are eight seed packets, the seeds of which are to be planted; poems are printed on the colorful envelopes. Diane Di Prima. Revolutionary Letters. HERE ARE THIRTY-FOUR revolutionary poems, reflecting the poet's increasingly activist sentiments as she moved from being one of the primary activists in the Beat movement to becoming a participant in the hippie movement in the late sixties. Di Prima continued to publish books of poetry, but she considered herself an anarchist as well as a Buddhist, and she attended many of the protest marches, especially those that opposed the war in Vietnam. She still publishes her poetry. 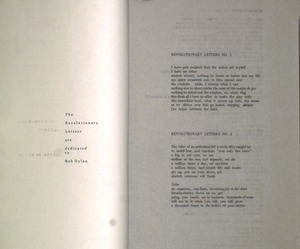 Revolutionary Letters is dedicated to Bob Dylan. 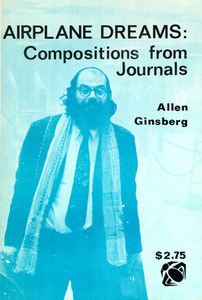 Allen Ginsberg. Airplane Dreams: Compositions from Journals. ALLEN GINSBERG, HAVING become a spokesperson for the Sixties Generation, kept up his exhausting schedule, appearing at most every political, social, and musical event, often wearing white robes and playing his Indian drums or the harmonium. Somehow he found time to travel to India, Nepal, and to Vietnam where he experienced first hand the horrors of the unfolding war. "Understanding That This Is a Dream" was written in Saigon­. Other poems include "New York to San Fran" and "Consulting I Ching Smoking Pot Listening to the Fugs Sing Blake." Zap Comix. Issue No. 2. R. CRUMB MOVED to San Francisco in 1966 and quickly established himself as the most successful of the underground cartoonists working in the Haight-Ashbury community. His audience found much to admire in his graphic sexual and violent depictions of uptight, middle class America, and his Zap Comix series were both financially successful and highly influential. In 1967, Janis Joplin commissioned Crumb to make a drawing for her album cover, Cheap Thrills, bringing him exposure to a national audience for the first time. Several of his characters, notably Fritz the Cat, Mr. Natural, and Whiteman, have become recognized cultural icons, and today Crumb is a highly respected and well paid artist who has been the subject of the 1995 film documentary, Crumb. 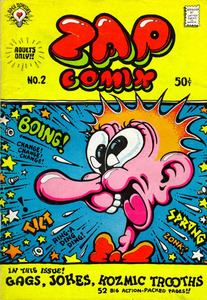 Head Comix is the first mainstream publication for R. Crumb, featuring many of his most popular creations. OFTEN CALLED THE godfather of modern environmental activism, Edward Abbey considered himself an anarchist devoted to drawing attention to the damage that was being done by government and business interests to our national parklands. Abbey found a ready following among those who were dropping out of society to find peace and solitude in the countryside. He inspired a generation of radical activists, most notably the environmental group, Earth First!, which impedes the progress of developers and of forest lands by sabotaging bulldozers and implanting trees with chainsaw-destroying spikes. 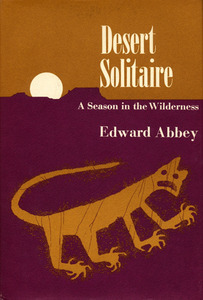 Desert Solitaire is a collection of essays written about the deserts of the Southwest United States where Abbey lived and worked. FIRST PUBLISHED IN August 1965, the Berkeley Barb was the original and most influential of all underground student newspapers that appeared to chronicle the burgeoning counterculture movement as it swept through the San Francisco area. 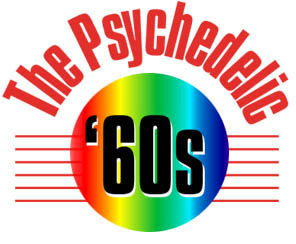 Founded on the University of California at Berkeley campus, the Barb covered civil rights and anti-war movements and became the social conscience of every social, political, musical, and mind-expanding event held in the San Francisco area over the following decade. 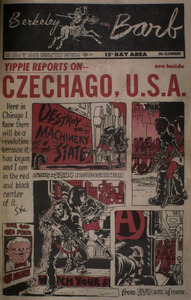 This issue is from August 1968. Norman Mailer. The Armies of the Night. New York: Signet Books, 1968. THIS IS NORMAN Mailer's "History as a Novel, The Novel as History," account of his participation in the October 1967 march on the Pentagon. Mailer was among the first of hundreds who attempted to break through police lines surrounding the entrances to the Pentagon and were subsequently arrested and thrown in jail. Mailer had been an outspoken critic of the war in Vietnam and was willing to use his celebrated name to lend weight to causes that denounced U.S. involvement overseas. 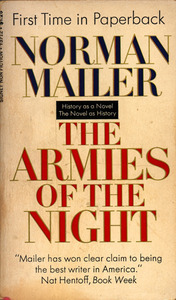 A few years earlier, Mailer, along with Allen Ginsberg, had testified in court to the artistic merits of William Burrough's novel Naked Lunch, during that novel's obscenity trial.